The Glenholme School, one of the nation’s most comprehensive special needs boarding schools located in Washington, CT, celebrated its 50th anniversary with a Jubilee Gala. 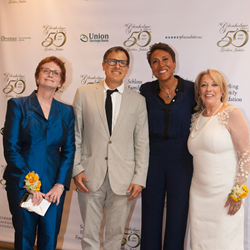 Barbara Feeney, David O. Russell, Robin Roberts, and Maryann Campbell at The Glenholme 50th Jubillee Gala on June 29, 2018. The Glenholme School, a special needs boarding and day school, celebrated its 50th anniversary with an elegant jubilee gala at the Ethan Allen Hotel in Danbury, Connecticut, on Friday, June 29, 2018. The evening was distinguished by an assemblage of faculty, families, and former students, along with honorees and celebrities. Film director David O. Russell and Robin Roberts of ABC’s “Good Morning America” lent their star-power to the magnetic evening. Leading the evening as emcee to the honorees, Robin captured the essence of the Van Sinderen “legacy” with each detail of their philanthropy to the town of Washington, and the gift of their estate, The Glenholme Farm, to Devereux. Jeff Gildersleeve, a current Glenholme board member, accepted the Beacon of Hope award on behalf of his family and their contributions to the lives of many young people over the last 50 years. Robin bestowed awards to three other honorees. Susan and her late husband Bruce Glickman were honored for their devoted efforts to advance the school’s programs while serving as board member and board chair respectively. Barbara Feeney, former Glenholme parent and current Board Chair, designer of the Beacon of Hope award, received this honor as recognition of her passion to address the needs of children with mental health needs who lack access to appropriate programs. Ending her 42-year career at Glenholme, Maryann Campbell was honored for her dedicated service and program development. Following a well prepared dinner meal, two incredible trips to exhilarating places enticed the crowd bythe auctioneer who then led a comic-sprinkled “fund the mission” challenge to raise money for The Glenholme School Scholarship. The Glenholme School extends profound thanks to the event sponsors and supporters including W. Diamond Group Corporation, the Schloss Family Foundation, Wire Frame Solutions, Hearst Foundations, United Savings Bank, Cherbec Advancement Foundation, the Darling Family Foundation, and Sammy Group of China. As well as the evening’s outstanding donors, Terry and Barbara Feeney, and David O. Russell. Devereux Advanced Behavioral Health— The Glenholme School, is an independent, coeducational, special needs boarding and day school for young people with high functioning autism spectrum disorders, ADHD, OCD, Tourette, depression, anxiety, and various learning differences. The program provides a treatment milieu designed to help students build competence socially and academically. The learning environment supports and enhances the ability of young people with special needs to succeed. Devereux Advanced Behavioral Health is a leading nonprofit behavioral health organization that supports many of the most vulnerable members of our communities. For more information about The Glenholme School and its program, visit http://www.theglenholmeschool.org/. Look inside Glenholme's Viewbook for the details on the many programs the school provides to students with special needs.